The ProdecoTech Phantom X3 is an e-bike decked out with a ton of name brand components (SRAM, Avid, Rock Shox, Truvativ) and a large (38.4V 16ah) LifePo4 battery for an amazingly low price of $1,899 (USD). In addition, the Phantom X3 and all ProdecoTech electric bikes are assembled in the USA at their facility near Fort Lauderdale Florida. Here is my report from a tour of the new ProdecoTech facility with a bunch of pictures and a video. Make sure you check out part 1 of this review with a video, large detailed pictures and specifications of the Phantom X3 to get familiar with this e-bike. 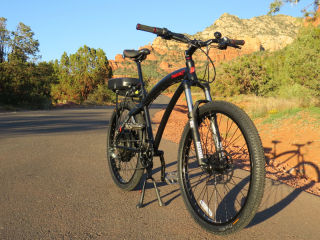 In this second part of the full review of the ProdecoTech Phantom X3 e-bike, you will get an idea of the ride characteristics, range test, pros, cons, and overall thoughts on this e-bike. 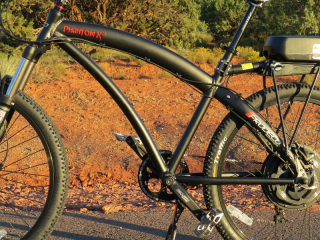 The Phantom X3 is similar to the Outlaw series of e-bikes in some respects with its laid back style aluminum frame and solid mix of name brand components. Large, curved tubing is a signature of these ProdecoTech aluminum frames and provides a unique look that sets them apart from other e-bikes. The Phantom X3 currently is available in one frame size (approx. 18″ frame). A 500 watt direct drive rear hub motor powers the Phantom X3 up to 20 mph, with or without your pedaling. The motor is pretty quiet and it has some get up and go! More on that in a bit. One of the big features of the Phantom X3 is the rather large 38.4V 16ah LiFePo4 (lithium iron phosphate) battery pack. That is much larger than the typical 36V 10ah found on a lot of electric bikes. And that equates to more range; more on that in a bit. 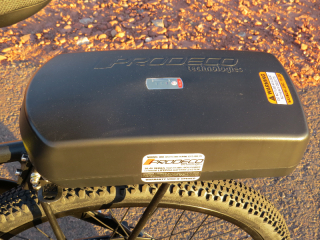 The battery pack is attached to a rear rack that is bolted to the aluminum frame. It would be nice to see a more secure attachment of the rack to the frame (ex. welded) because there is the potential for the bolts to loosen. A key locks the pack to the rack and is also used to turn the electrical system on or off. An included charger can charge the empty battery pack in 8 hours and it plugs into any normal wall outlet. A twist grip throttle is how you add electric assist to your ride. There may be an optional upgrade to a torque sensor pedal assist in the future. There is a battery level indicator on the twist grip throttle with full, half, or empty battery levels. 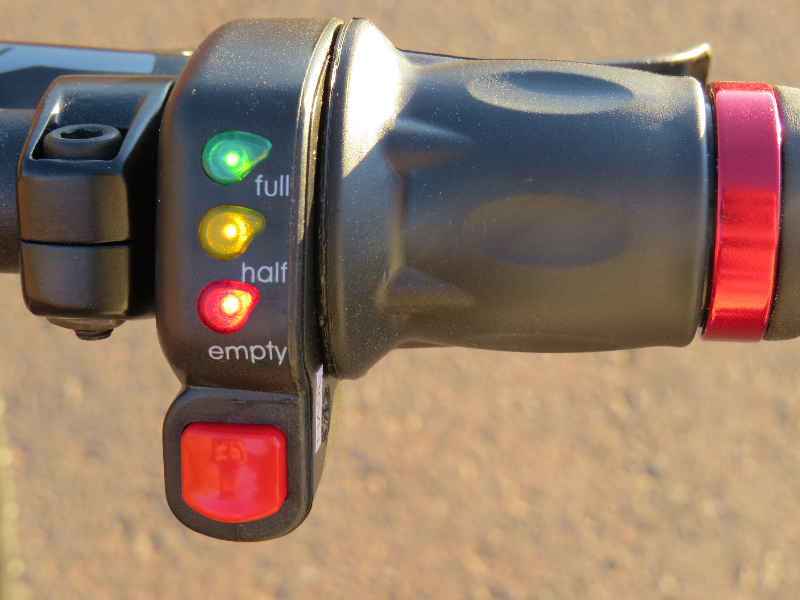 In addition there is an on/off switch for the throttle in case you want to ride without assist. 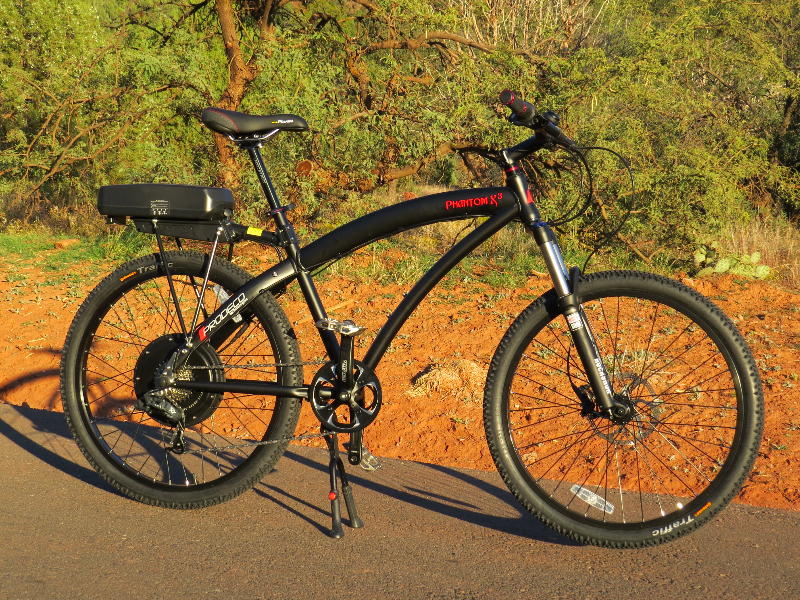 The ProdecoTech Phantom X3 is an electric bike with a great component spec. ProdecoTech has a good relationship with SRAM who owns the Rock Shox, Avid, and Truvativ brands. The SRAM drivetrain (8 speed SRAM X7 shifter and rear derailleur) provides solid and crisp shifting. The gear range is set up well for climbing hills and cruising along the flats at around 20 mph. 120 mm of smooth travel on the Rock Shox XC32 suspension fork is a nice feature for riding on rough roads. This fork also features a lock out option for when you want to have a more rigid bike for riding on the road. Turning a dial on the right side of the fork locks it out. 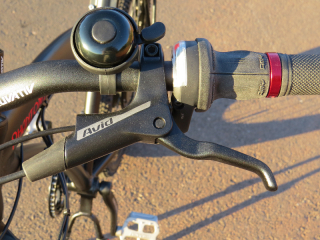 The new Avid DB hydraulic disc brakes are powerful and they have that smooth and solid feel that you can expect from hydraulic brakes. These new DB brakes have a nice matte black finish that matches the look of the Phantom X3 very well. 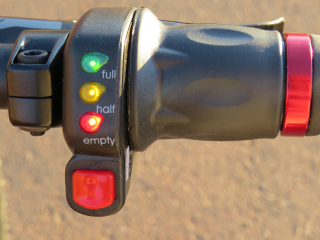 Truvativ components are used for the handlebars, stem, cranks, and pedals. These components have a high quality look and feel. The handlebars are nice and wide for improved stability and the pedals have a large grippy platform. The Continental Traffic tires have a smooth center tread for efficient riding on the road and they offer some knobby tread on the side for cornering in off road conditions. The Traffic tires are 2.1″ wide and that is nice size for a versatile tire. Ahhh, the small details. 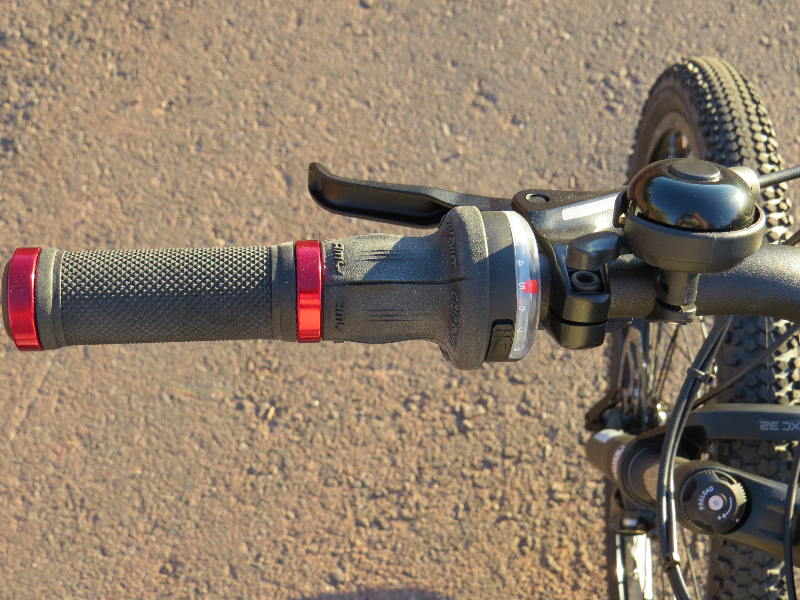 It is nice to have lock on grips because the never slip around on the handlebars. It’s something small but it makes a big difference in the overall ride feel. Speaking of details, the Phantom X3 comes equipped with a double legged kickstand. It is a great kickstand that provides a lot of stability to the bike when it is parked. The Phantom X3 has a mountain bike look to it but it is best suited for riding on the road with some dirt road & easy trail riding. It is not really set up for rough mountain bike trails. Like the ProdecoTech Outlaw bikes, the Phantom X3 has a very laid back riding style. The seat tube of the frame has a very relaxed seat tube angle and the bike comes with a fairly long stem so the riding position is pretty stretched out. The front end of the bike is a bit light because of the heavy battery on the rear rack. You can feel the weight of the battery on the rack when standing out of the saddle to pedal, when taking a hard corner, or when lifting the bike. 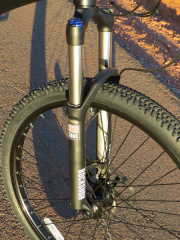 When riding on relatively smooth roads it is nice to have the lockout feature on the Rock Shox XC32 suspension fork so that it does not “bob” when you are pedaling while standing out of the saddle. 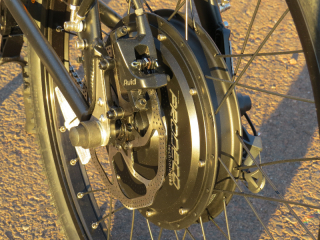 The 500 watt direct drive rear hub motor has some nice torque to get you up to speed quickly (20 mph max). It is a smooth and quiet motor that can provide a little or a lot of assist with the twist grip throttle. The high quality components on the bike make it feel solid. The SRAM X7 grip shifter has it’s characteristic crisp shifting and the Avid DB hydraulic disc brakes do a great job of slowing the Phantom X3 down quickly. 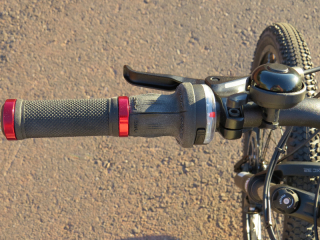 I mentioned the lock on grips before and they really do provide a nice feel, especially because you know they aren’t going to rotate on the handlebars! It’s a small detail that makes a big difference. Speaking of connections to the bike; the Velo saddle is a comfortable medium sized saddle and the Truvativ pedals provide a large grippy platform. Here is the real world information on how the ProdecoTech Phantom X3 electric bike performed on my typical riding circuit that includes hills, flats, traffic, wind (when available) etc. The results below are based on a paved circuit that I use for testing other electric bikes. While testing these bikes I like to put them through the toughest conditions to see where their bottom line is in regards to range and speed. Range: As you can see from the GPS info that I recorded, the ProdecoTech Phantom X3 traveled 30.6 miles and did a total elevation gain/loss of around 2,900 ft. 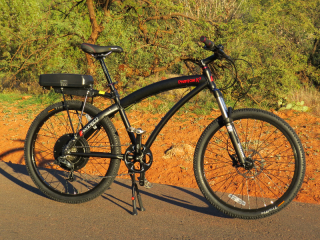 Considering that I weigh 190 lbs and I pedaled very lightly this is good range for a 38.4 Volt 16 ah battery pack (614 Watt Hours) with a 500 watt motor. Please keep in mind that if you pedal more, weight less than me, ride slower and/or you use the bike in terrain that is not as hilly you will get more range. These results are from tough testing. Speed: The ProdecoTech Phantom X3 can get up to around 20 mph on flat ground. It is a little slower than that on the climbs but it still goes pretty fast! Weight: This bike tips the scales at 64 lbs. The weight distribution of the ProdecoTech Phantom X3 is pretty back heavy because of the rear hub motor and the battery pack being mounted on the rear rack. 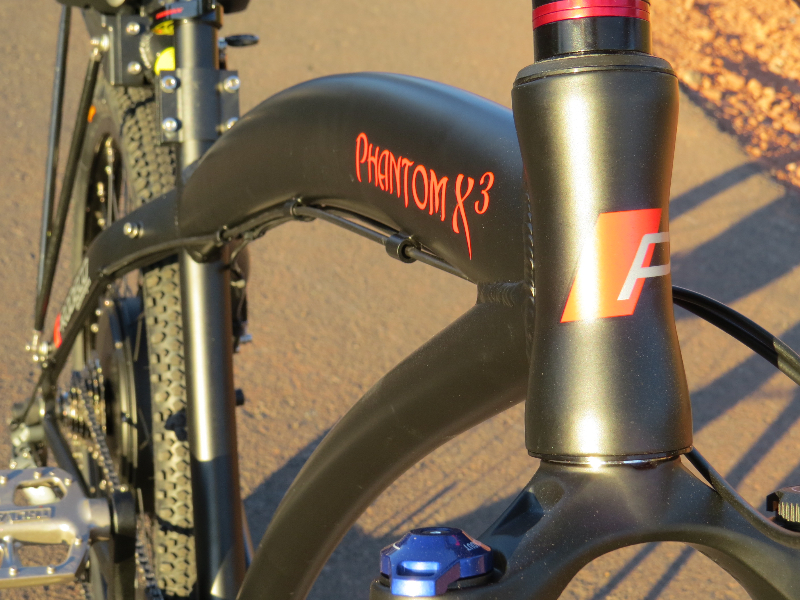 Amazing Bike for the Price: For $1,899 you get a lot in the ProdecoTech Phantom X3! A large battery, (38.4V 16ah LiFePO4 compared to the traditional 36V 10ah battery), along with a bunch of well know brand name components from SRAM, Avid, Rock Shox, Truvativ, etc. It is hard to find a similarly spec’ed electric bike for this price. 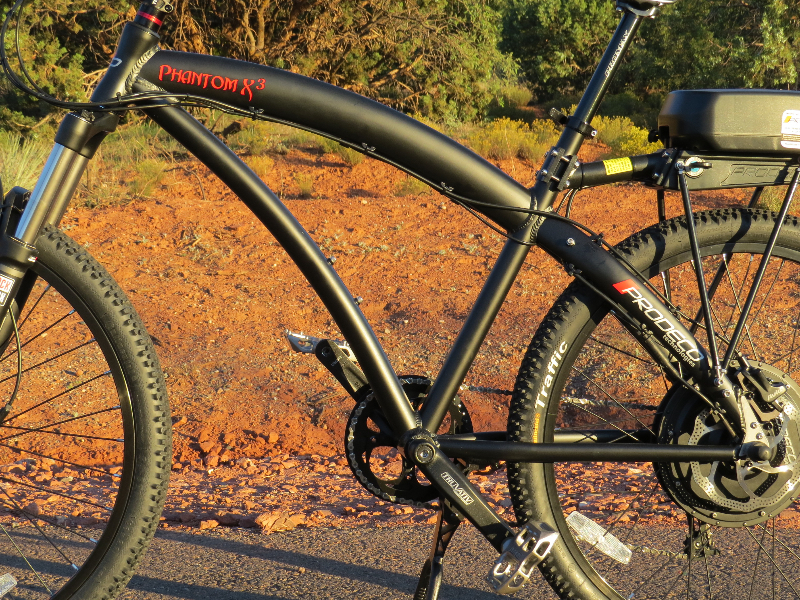 Big Battery: If you want more range than the typical e-bike then the Phantom X3 delivers. My test route is pretty tough with a lot climbing and light pedaling on my part. Even with that the Phantom X3 managed 30+ miles of range. With less climbing and more pedaling you could expect more range. Assembled in the USA: All ProdecoTech bikes are assembled at their facility near Fort Lauderdale, Florida. That is very unique in the bicycle industry. Here is virtual tour of the ProdecoTech assembly facility. Back Heavy: The majority of the weight is on the back of the bike because of the rear hub motor and the battery mounted on the rear rack. You can feel the back heavy weight when standing out of the saddle to pedal, when taking a hard corner, or when lifting the bike. 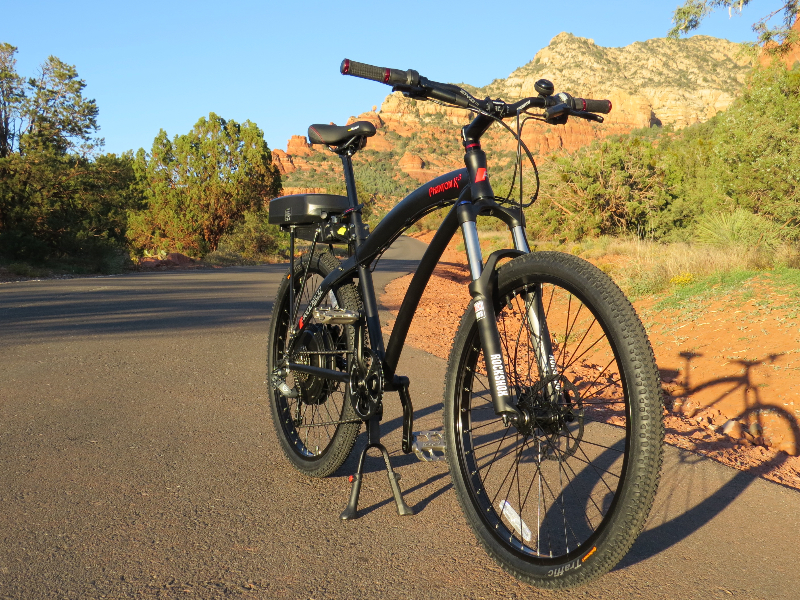 Overall the ProdecoTech Phantom X3 provides a lot of e-bike for the money ($1,899). It delivers a lot of range from the large battery pack and its array of brand name components is impressive. The Phantom X3 is a nice bike for cruising on the roads with some “light” off road adventures. The ProdecoTech Phantom X3 retails for $1,899 (USD) at the time of this review. Where to buy the ProdecoTech Phantom X3? Check with ProdecoTech for a dealer near you. If there is not a dealer nearby you can order the Prodeco Phantom X3 online. Do you have any questions about the ProdecoTech Phantom X3? Do you own the ProdecoTech Phantom X3? Please share your thoughts in the comment section below. for a Great Price Point! I purchased the X2 version of the Phantom with the 12 ah battery in March 2013, having logged over 600 miles since purchase. The bike has more than exceeded my expectations. Top of the line components and great fit and finish. I live near the Great Allegany Passage Trail that runs from Cumberland, MD to Pittsburgh, PA and ride this trail frequently. My personal mileage record on 1 charge (GPS verified) is 38.4 miles on 1 charge on the Great Allegany Passage.